Directions: The entrance to Calvary Cemetery [ Waypoint = N38 41.681 W90 14.311 ] is located at 5239 West Florissant Avenue in St. Louis, Missouri 63115. Return to your car and head north to leave Fairground Park. 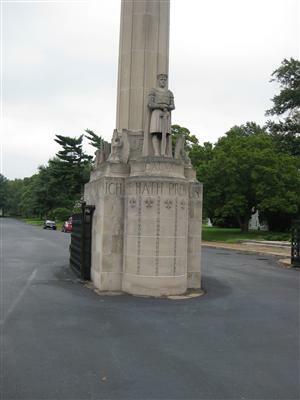 Upon leaving the park, go straight to cross over Kossuth Avenue and continue north on Prairie Avenue. After about 0.4 miles, turn left (west) onto W. Florissant Avenue. After about 2.1 miles, the entrance to Calvary Cemetery will be on your right, just past the intersection with Calvary Avenue. 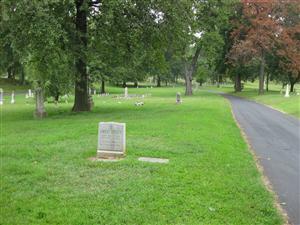 Description: This tour will focus on four grave sites of interest concerning St. Louis and the Civil War. 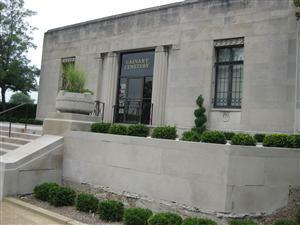 Be sure to stop in at the visitor center near the entrance to pick up a map of the cemetery. Here is a link to a PDF of the map on the cemetery's website. 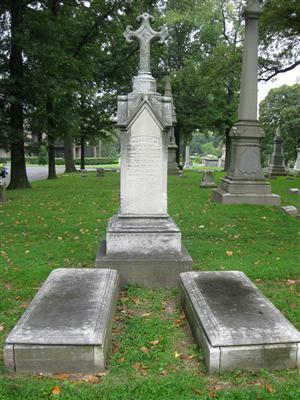 For additional Civil War graves of interest in Calvary Cemetery, consult William C. Winter's Civil War in St. Louis listed in the Tour's References. The roads in the cemetery are not always well marked. Try to pay attention to the Section numbers as you try to locate the grave markers. The Daniel M. Frost Grave at Calvary Cemetery [ Waypoint = N38 41.797 W90 14.170 ] is located in Section 18, Lot 48. 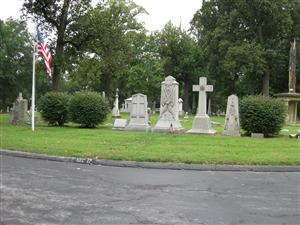 From the entrance to Calvary Cemetery, proceed straight ahead and take the first right. Just after turning right, find a place to park. Cemetery Section 18 will be on both sides of the road. Frost's grave is located in the southeast corner of Section 18 on the north side of the road. Neither he nor his men had any very precise idea of the part which they would be called upon to take in the event of war between the North and the South. 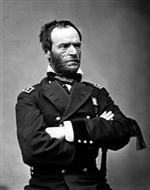 Like himself, they were, for the most part, Union men, but opposed to the subjugation of the South. Few of them expected to use their arms against the United States; fewer still to use them against the South. They were citizens and soldiers of Missouri and were ready to fight for her. Further than that they did not then look, or care to look. No one comprehended more clearly than General Frost the necessity which compelled Missouri to keep the arsenal and its stores within her grasp, if she would arm and equip her people; as arm them she must, sooner or later, whether to fight for the Union, or against it, or to maintain her own neutrality. This necessity he made manifest to the Governor, and was by him authorized to seize the arsenal, whenever the occasion might require such decisive action. I have just returned from the arsenal . . . I found the Major everything that you or I could desire. He assured me that he considered that Missouri had, whenever the time came, a right to claim it as being on her soil . He asserted his determination to defend it against any and all irresponsible mobs, come from whence they might, but at the same time gave me to understand that he would not attempt any defense against the proper State authorities . . . In a word, the Major is with us, where he ought to be. This arsenal, if properly looked after, will be everything to our State, and I intend to look after it; very quietly, however. SIR: I never for a moment having conceived the idea that so illegal and unconstitutional a demand as I have just received from you would be made by an officer of the U.S. Army I am wholly unprepared to defend my command from this unwarranted attack, and shall therefore be forced to comply with your demand. 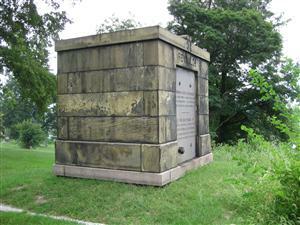 William T. Sherman's Grave [ Waypoint = N38 41.909 W90 14.217 ] is located in Section 17, Lot 8. From the Frost grave site, get headed east and take a left at the T intersection. You should now be headed north with Section 18 on your left and Section 12 on your right. Veer left when you come to a fork just ahead. Section 18 is still on your left and Section 12 on your right. After no more than 0.1 miles, you will come to another fork in the road. Go to the left. Stop at the next interaction (about 100 yards ahead). 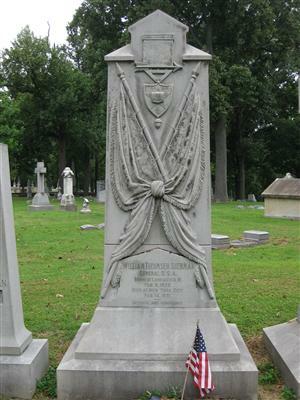 Directly across from you in Section 17 should be the William T. Sherman grave marker. The whole air was full of wars and rumors of wars. The struggle was going on politically for the border States. Even in Missouri, which was a slave State, it was manifest that the Governor of the State, Claiborne Jackson, and all the leading politicians, were for the South in case of a war. The house on the northwest corner of Fifth and Pine was the rebel headquarters, where the rebel flag was hung publicly, and the crowds about the Planters' House were all more or less rebel. There was also a camp in Lindell's Grove, at the end of Olive Street, under command of General D. M. Frost, a Northern man, a graduate of "West Point, in open sympathy with the Southern leaders. This camp was nominally a State camp of instruction, but, beyond doubt, was in the interest of the Southern cause, designed to be used against the national authority in the event of the General Government's attempting to coerce the Southern Confederacy. Will you accept the chief clerkship of the War Department? We will make you assistant Secretary of War when Congress meets. I have quite a large family, and when I resigned my place in Louisiana, on account of secession, I had no time to lose; and, therefore, after my hasty visit to Washington, where I saw no chance of employment, I came to St. Louis, have accepted a place in this company, have rented a house, and incurred other obligations, so that I am not at liberty to change. I thank you for the compliment contained in your offer, and assure you that I wish the Administration all success in its almost impossible task of governing this distracted and anarchical people. Dear Sir : I hold myself now, as always, prepared to serve my country in the capacity for which I was trained. I did not and will not volunteer for three months, because I cannot throw my family on the cold charity of the world. But for the three-years call, made by the President, an officer can prepare his command and do good service. I will not volunteer as a soldier, because rightfully or wrongfully I feel unwilling to take a mere private's place, and, having for many years lived in California and Louisiana, the men are not well enough acquainted with me to elect me to my appropriate place. Should my services be needed, the records of the War Department will enable you to designate the station in which I can render most service. A crowd of people was gathered around, calling to the prisoners by name, some hurrahing for Jeff Davis, and others encouraging the troops . . . The man had in his hand a small pistol, which he fired off, and I heard that the ball had struck the leg of one of Osterhaus's staff; the regiment stopped; there was a moment of confusion, when the soldiers of that regiment began to fire over our heads in the grove. I heard the balls cutting the leaves above our heads, and saw several men and women running in all directions, some of whom were wounded. Of course there was a general stampede. Charles Ewing threw Willie on the ground and covered him with his body. Hunter ran behind the hill, and I also threw myself on the ground. The fire ran back from the head of the regiment toward its rear, and as I saw the men reloading their pieces, I jerked Willie up, ran back with him into a gulley which covered us, lay there until I saw that the fire had ceased, and that the column was again moving on, when I took up Willie and started back for home round by way of Market Street. 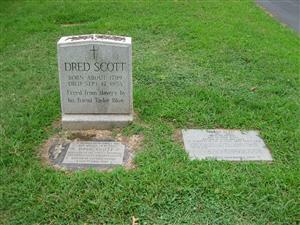 The Dred Scott Grave at Calvary Cemetery [ Waypoint = N38 42.003 W90 13.917 ] is located in Section 1, Lot 77. Now directions get a little more challenging. You will want to turn right so that the Sherman grave is on your left. Veer left when you come to a fork just ahead. Section 13 is on your left and Section 12 on your right. After about 0.25 miles, you will come to a “four corners” of sorts. Pause at the intersection to verify that Section 14 is on your left and Section 1 is on your right. You should turn right and see that Section 1 is on both your left and your right. Drive on and stop after 0.1 miles. 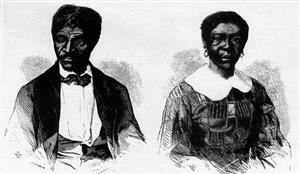 The Dred Scott grave site should be on the right hand side of the road. We think they are not, and that they are not included, and were not intended to be included, under the word 'citizens' in the Constitution, and can therefore claim none of the rights and privileges which that instrument provides for and secures to citizens of the United States. The Thomas C. Reynolds Grave [ Waypoint = N38 41.987 W90 13.790 ] is located in Section 1, Lot 231. Return to your car and head east about 50 yards to a T in the road. Turn right to head south and continue about 100 yards to another “four corners” area. Turn left. You will find that this is actually a U-turn and you are now heading north. Continue about 100 yards and veer right on a fork in the road. After about 50 yards, park on the side of the road. The Reynolds grave is about 50 yards east of the cemetery road right on the boundary of the cemetery overlooking Calvary Avenue. In our system a State is its people, citizens compose that people, and to use force against citizens acting by State authority is to coerce the State and to wage war against it. To levy tribute, molest commerce, or hold fortresses, are as much acts of war as to bombard a city. The responsibility for disgraces and disasters . 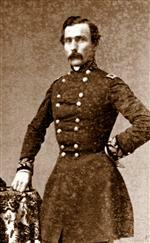 . . of the army at the time [are] justly attributed to the glaring mismanagement and distressing mental and physical military incapacity of Major General Sterling Price. After the war, Reynolds went into exile in Mexico with a number of other Confederates. 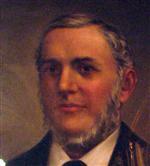 Reynolds returned to St. Louis in 1869 and was elected to the Missouri Legislature in 1874. Reynolds killed himself in 1887 by jumping down an elevator shaft at the Customs House in St. Louis.